In The Helios Protocol, reeling from the events in Freiburg, Alfred and Adam are rescued by Yves and Webb only to be sent to Malta to track down The Daughters of Helios. They find a lot more than they bargained for and the final showdown is nothing like Alfred imagined. Only when they return to Italy to visit William and pay their respects do they find out the whole story of the Helios Protocol. 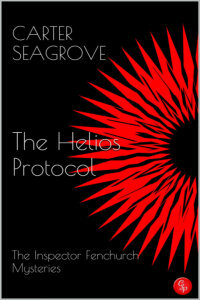 The Helios Protocol is the fourth story from the series, The Inspector Fenchurch Mysteries. It follows immediately on from Stradler’s Game (the 3rd) and Black Veil (the 2nd). The series debut is titled The Blakely Affair.